As the season winds down, talk turns to awards for the year. MVP, Cy Young, Comeback Player of The Year, and Rookie of the Year. So let's talk about this year's Cy Young candidates. Since the Cubs are in the National League, let's start there. Your 2009 NL Cy Young Winner is . . . Tim Lincecum. Meet the new boss, same as the old boss. 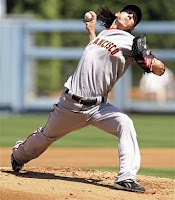 Lincecum currently sports a 14-6 record in 30 games started with an ERA of 2.47 and a WHIP of 1.06. The emo kid has struck out 247 in 211.1 innings pitched and walked only 63. He's only surrendered 10 long balls while hurling 4 complete games and 2 shutouts. 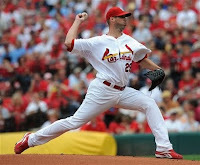 Runners up are the dynamic duo from St. Louis, Adam Wainwright and Chris Carpenter. Cub killer Carpenter has posted a 16-4 record in 26 games with an ERA of 2.34 and a WHIP of 1.01. Carp struck out 136 batters while walking only 34 in 180.2 innings. 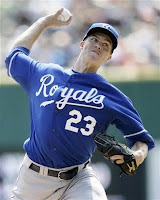 He has 3 complete games and 1 shutout in 2009, while coughing up only 7 home runs. Wainwright has put up an 18-8 record in 32 games with an ERA of 2.59 and a WHIP of 1.21. The Cardinal youngster notched 193 Ks and gave up 63 walks in 219 innings pitched. He has only 1 complete game and no shutouts this season. So why Lincecum? I think if Carpenter hadn't missed the first month, he really would be the no doubt pick here. Wainwright has just been ridiculous as well. All three of these guys have pretty similar numbers, but what really does it for m e is that Lincecum has 247 strikeouts to Wainwright's 193, and his ERA at the moment is slightly lower. Plus, while Lincecum has fewer wins than the other two guys, he's also pitching for a team with less offensive ability than the Cardinals. All three guys are great pitchers and with a few starts left to go, there's still a chance for things to swing toward one of the Redbird hurlers. And the AL. Let me just say this: if Zack Greinke manages to win the AL Cy Young pitching for the Kansas City Royals, not only does he deserve praise and admiration, but a lifetime supply of blow jobs from Erin Andrews. Greinke has been unbelievably good this year on a team that's someti mes unbelievably bad. The Zacker should be sporting around 22 wins, but lack of offense and some poor middle relief have cut into his win totals. He currently has a 15 and 8 record in 31 starts with a nifty ERA of 2.08 and a WHIP of 1.06. He's K'd 229 batters and walked 47 in 216.1 inning pitched. He has 6, count them, 6 complete games with 3 shutouts. 15 wins may be low for a Cy Young winner, but holy crap this kid has just been beyond good. 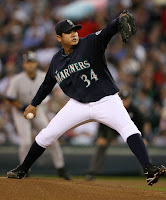 Runner up: Felix Hernandez of the Seattle Mariners is 16 and 5 in 31 starts with an ERA of 2.45 and a WHIP of 1.14. He's struck out 196 and walked 64 in 216.1 innings pitched. He has 2 complete games and 1 shutout on the year. Why Zack?King Felix may have more wins, but 6/3 CG/SHOs for Greinke and 2/1 for Hernandez, plus the K/BB numbers bring it all on home for the Zack Attack. Both of these guys would have more wins if they were on better teams. These are my Cy Young predictions. Feel free to debate and make your own in the comments.